Off-duty police officers, on a Christmas night out, discovered a man with two types of drugs in a Campbeltown bar. 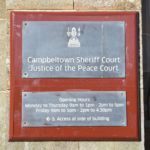 Procurator fiscal depute Eoin McGinty told Campbeltown Sheriff Court the officers saw Stuart Gillies, 20, of 10 Killeonan, Campbeltown holding a bag of white powder in the pub toilet after 1am on December 22 last year. He pleaded guilty to having 0.9g of cocaine and cannabis of minimal value. Defence solicitor Stephen MacSporran said his client’s parents had a ‘few choice words’ with their son.